So, we headed to Colorado this week, and as a present for the relative in whose basement we like to crash while there we picked some oranges and grapefruit from the trees in our backyard. I didn’t feel like handing them over in a plastic shopping bag, though (not classy!) 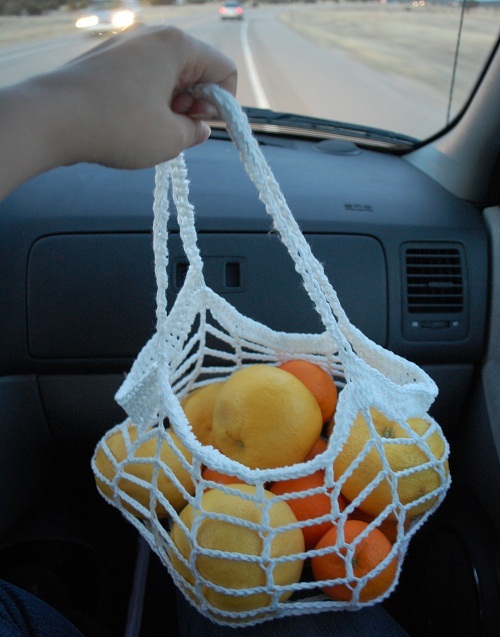 so during the drive I whipped up some white cotton mesh bags. 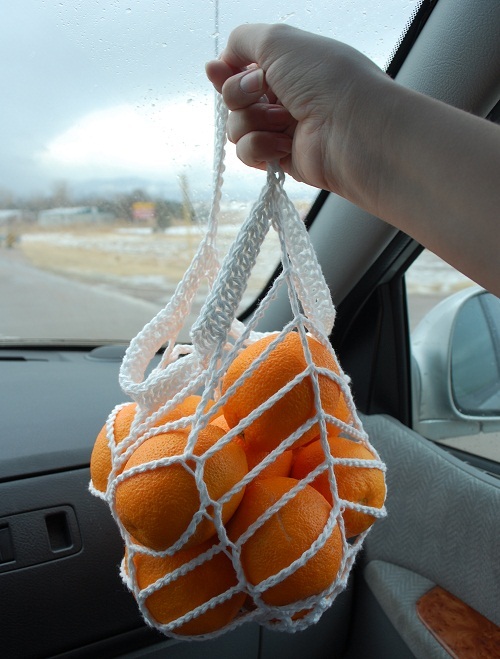 This bag held six oranges and six large grapefruit. Would you like to make one? Rnd 1: Ch 4. *[Dc, ch 1] in 4th ch from hook. Repeat from * 5 more times; sl st in 3rd stitch of starting ch to join. Rnd 2: Ch 5. *Skip ch from previous rnd, dc in next dc. Ch 2. Rep from * around; sl st in 3rd ch of ch 5 to join. Rnd 3: Ch 7. *Skip chains from previous rnd, dc in next dc. Ch 4. Rep from * around; sl st in 3rd ch of ch 7 to join. Rnd 4: Ch 10. *Skip chains from previous rnd, dc in next dc. Ch 7. Rep from * around; sl st in 3rd ch of ch 10 to join. Rnd 5: Ch 14. *Skip chains from previous rnd, dc in next dc. Ch 11. Rep from * around; sl st in 3rd ch of ch 14 to join. Rnd 6: Ch 10, dc around center of ch-11 from Rnd 5; ch 7. *Dc in next dc, ch 7. Dc around the center of the ch-11 from Rnd 5; ch 7. Rep from * around, sl st in 3rd ch of ch 10 to join. Rnds 7-13 (or desired length): Ch 10. *Skip chains from previous rnd, dc in next dc. Ch 7. Rep from * around; sl st in 3rd ch of ch 10 to join. Rnd 14: Ch 3; dc in each ch and dc around. Sl st in 3rd ch to join. Rnd 15: Ch 1, sc in the same st. Ch 45; skip 31 dc, sc in next dc. Sc in each of the next 32 dc. Ch 45, skip 31 dc. Sc in next st and each of the next 31 dc. Join rnd. Rnd 16: Ch 1; sc in each sc and ch around, join rnd. Finish off, weave all ends securely. I also made a smaller one. I put a dozen oranges in it, but that was stretching its capacity. It would have been much happier with something like eight. I’ve got directions for this one, too! Rnds 1-4: Work as for big orange bag. Rnd 5-11 (or desired length): Ch 14. *Skip chains from previous rnd, dc in next dc. Ch 11. Rep from * around; sl st in 3rd ch of ch 14 to join. Rnd 12: Ch 3; dc in each ch and dc around. Sl st in 3rd ch to join. Handle: Ch 20. Sl st in point of Rnd 12 directly opposite. Sl st in next st (of Rnd 12), sc in each st of the ch-20. Sl st into next st of Rnd 12 to join. Finish off; weave in ends. I don’t know how you do it in that climate though. Gotta have my seasons (snow!)! i would like to make one. can u please explain round 1-4 in detail? i don’t understand how to start it. Please email me. I was wondering if you could estimate the yardage for this? Someone in my group is considering using it for a challenge, but there is a minimum yardage requirement, so we wanted to make sure your cute little bags would work for it. I’m afraid I just don’t know – I was working off a cone as we drove to Colorado, and they’ve been given away now so I’m not sure how much yarn they took. Great bags. I’m imagining them holding potatoes and all sorts of other things too! I’m a little confounded on the first rnd though. (I haven’t gotten any further to know if I’m confounded on the others!). I’m uncertain which stitch to Dc, ch1 into after the first one, is the main thing. Thanks! Hi Emily! You’re supposed to dc, ch 1 into the same ch as the first double crochet.